Few seafoods have as much history and lore as oysters. The Romans first cultivated oysters over 2,000 years ago, and they have a rich tradition as an aphrodisiac. Today this ubiquitous bivalve is more popular than ever, as a revival of restaurant oyster bars have given Americans more opportunity to slurp these plump, savory morsels. The Kumamoto has been introduced to the West coast from Japan. “Kumos,” which are about 2 to 3 inches in shell length, have a very deep cup and a large meat for their size. Even though it’s the same species, the flavor of an oyster will vary considerably, depending upon where it’s grown. Oysters are filter feeders, siphoning up to 25 gallons of water a day through their system. The flavor of their meat is a function of the trace minerals (especially salt) in the water they grow up in. Oysters can be eaten as an appetizer or an entrée, depending on how you serve them. They are well-suited for poaching, baking, steaming, sautéing, deep-frying, or even raw. They can also be included in pastas or chowders. We also offer the first and ONLY Best Aquaculture Practices (BAP) Four-Star oysters in the world. Four-star is the highest designation in the BAP third-party certification program. For “fed” species, it signifies that a product originated from a BAP-certified processing plant, was sourced from a BAP-certified farm, and has utilized seed and feed from BAP-certified hatcheries. 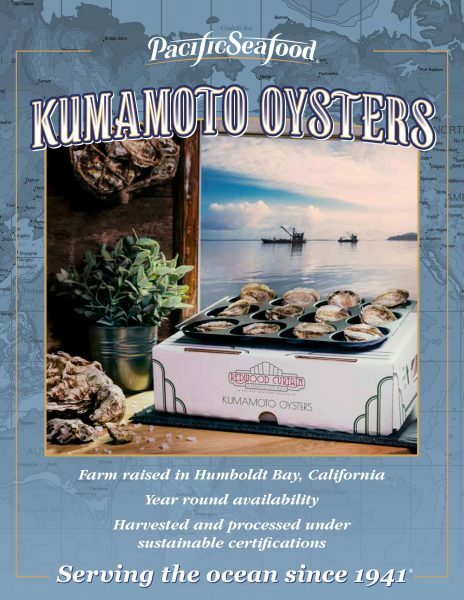 BAP’s mollusk farm standards contain many specifications for responsible stocking rates and monitoring of natural feeding processes, BAP has certified Pacific Seafood to offer four-star BAP oysters as opposed to just three-star BAP oysters.